I know TRS sponsors this forum, so curious if this gets taken down... or they actually address this issue as needed. The heat shrink on the main relay module is also super crap, with gaps and many places for water to enter. The 2nd harness failed for me at the relay connector, 1st harness failed first with the highbeam connectors then on the corroded 2-pin ballast connectors. Luckily I always have an electrical kit with me, so was able to power the ballasts direct off the battery with no switch or relay in the way. Had to continue the highway drive back into town, as a ~150km tow was the only other option except it was -15C and out of cell reception on a remote highway. Super dangerous -- lawsuit territory for sure if it had caused an accident or I had to spend the night on the side of the road. Sadly, there seem to be no better pre-made harnesses on the market to buy? Custom making one might be my only option? Last edited by Dbatch; October 23rd, 2018, 01:02 AM. They don't moderate this forum enough to take anything down haha. Yes the Motocontrol harnesses are known to have issues. Maybe not garbage, but the failure rate is disappointing. There is an alternative: Contact a company called DC Customs. They had their own H4 relay system built, I think based on XenonDepot harnesses? Either way hit them up. OP your pics aren't showing up. Yup DC Customs has controller modules (to keep the ballasts powered w/hight beams) used in conjunction with Xenon Depot's HID harness although the modules could also work with other relayed harnesses. The modules have a bulb-specific connector (H5, 9004, 9007 for example) for the input and a 9006/9006 connector for the relay harness input and 2-pin molex connector for the highbeam solenoids. I believe Halo has a XD harness, maybe he can pot details about them. Also if your vehicle is a Toyota that doesn't have DRLs through the H4 headlights, there's no need for any modules. Thanks for catching those missing photos -- they showed up at first, but are missing now? Disappointing that it's a common failure, and even more so that TRS support blamed it on me. I'll never shop with them again, and have moved all my purchases to ProLightz in QC, Canada... Best customer support, and free shipping on any warranties in Canada. Plus their prices are lower! Just basic H4 high/low, so a dual relay set up with a diode preventing the high beam solenoids from back-feeding with the low circuit is pretty easy... but I guess I was silly to think I could buy something close to as good as I could make myself. Oops. The Low/High positives overlap (both are on at the same time) for a tiny part of the lever stroke, so I shouldn't need a cap or more elaborate timer harness to keep the ballasts from on/off all the time, right? You're in luck,your Taco is a ground-switched/common positive ystem so you don't diodes, caps, and other stuff to complicate things. But on your truck, "Low Beam" and "High Beam" are grounds and "Negative" is a common positive. Relay(s) #85 connects to the common positive, #86 to a chassis ground, #30 to a fused positive, #87 to ballast positive. I had a brand-new Motocontrol unit fail on me within an hour of use, couldn't warranty it because I bought it from the original purchaser (who bought it brand new but never installed). 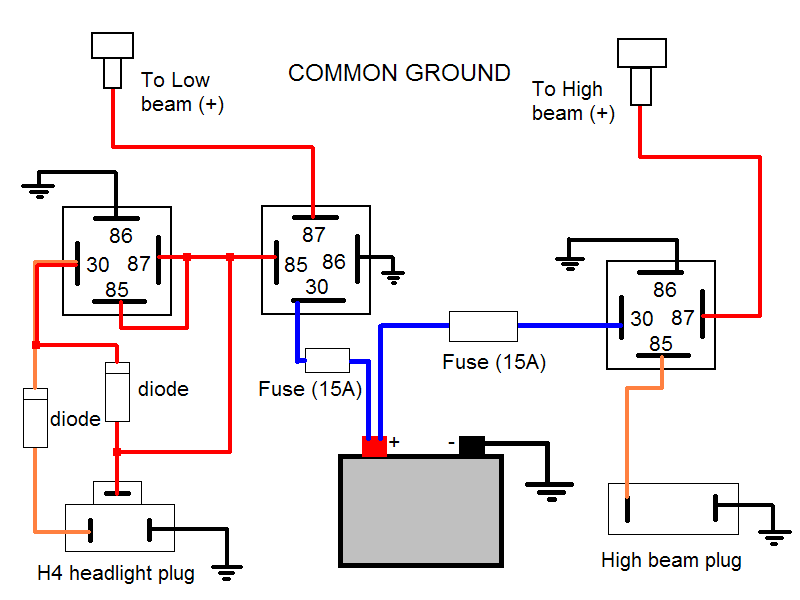 Are you trying to isolate the ground so it does not switch? 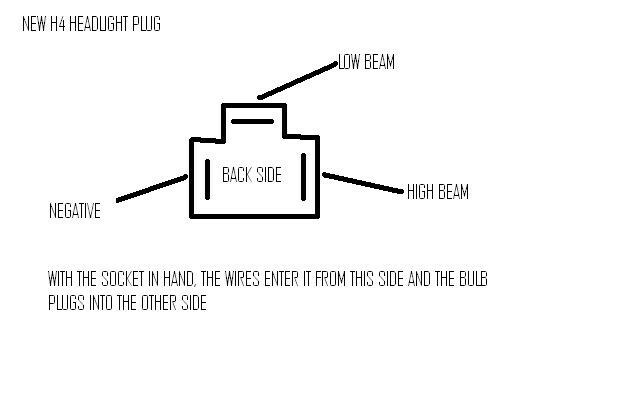 Explain why I would need modules for a OEM headlight system that already keeps the ballasts energized even with the high beams on? Oh I guess I was confused as to what you were initially saying, that is to isolate the ground on older toyotas that do have the switching grounds, my bad. I'm on my 2nd controller and it failed again twice in under a year. I just bought one on amazon, I have no patience for cheap Chinese garbage when it's -30* out and I'm swapping ballasts and bulbs chasing a ghost. Of course the last thing I check is the moto control module and its failed again. Hit up a builder called DC Customs. He has an alternative harness.